IEC 60601-1-12:2014 constitutes a collateral standard to IEC 60601-1: Medical electrical equipment - Part 1: General requirements for basic safety and essential performance hereafter referred to as the general standard. Medical practice is increasingly using medical electrical equipment and medical electrical systems for monitoring, treatment or diagnosis of patients in the emergency medical services environment. The safety of medical electrical equipment in this uncontrolled, rough environment is a cause for concern. This collateral standard was developed with contributions from clinicians, engineers and regulators. The terminology, requirements, general recommendations and guidance of this collateral standard are intended to be useful for manufacturers of medical electrical equipment and medical electrical systems and for technical committees responsible for the development of particular standards. 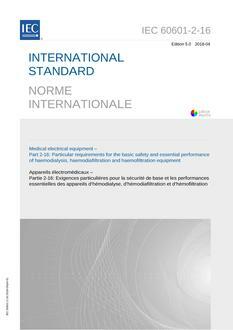 This International Standard applies to the basic safety and essential performance of medical electrical equipment and medical electrical systems, hereafter referred to as ME equipment and ME systems, which are intended, as indicated in the instructions for use by their manufacturer, for use in the EMS environment (Emergency Medical Services environment). The object of this collateral standard is to provide general requirements for ME equipment and ME systems carried to the scene of an emergency and used there, as well as in transport, in situations where the ambient conditions differ from indoor conditions. The object of this collateral standard is to specify general requirements that are in addition to those of the general standard and to serve as the basis for particular standards.